Sunny clear blue skies is in the Palm Springs weather forecast almost every day of the year. Rain is very rare (and almost never in the forecast). Although we did see several rainy days in 2017. However, very much needed and the rain comes and goes periodcially throughout the day. The natural beauty of Palm Springs California's climate brings steady sunshine and a warm, sunny, and dry climate. This puts Palm Springs among the world's most popular outdoor adventure areas with great hiking trails, nature walks, beautiful mountains, and world-class year-round Golf with 125 Palm Springs area Golf Courses. Monthly Average Temps - Does it rain? You can count on sunny weather in Palm Springs. An average of 350 or more days a year in Palm Springs bring sunshine, and the percentage of available sunshine time is about 90% sun! It rarely rains in Palm Springs. In many months each year (see detailed info below), there are spans of multi-month-long spans without any trace of measurable precipitation. This is why travelers from around the world spend Winter months in the Palm Springs area. It's year-round pool weather! It's true. Rainfall is very rare and extremely limited in the California Desert Areas of Palm Springs, Palm Desert and La Quinta, CA. In 2014, total rainfall in Palm Springs (entire year) was 1.7 inches (January through December). Yes, it's correct: less than two inches total rain during calendar year 2014. During 2015, the total rainfall in greater Palm Springs California metro area measured about 1.5 inches. In the past 4 years, 2013 thru 2016 rainfall has been held just under 2 inches for the entire year. Rain typically last for no longer than 24 hours, with skattered showers throughout the day. This allows visitors to enjoy the outdoors and escape to beautlful clear skies, no matter which months you choose to visit. How often does it rain in Palm Springs? It rarely rains in Palm Springs. Almost never. The average annual rainfall total in Palm Springs California area is recent years has been approximately two inches total. This is considerably less rain than the long-time average average of 5 inches cumulative total (sometimes less) for an entire year. In the past 30 years, Palm Springs average rainfall is about 5.5 inches. This small amount of rain annually in Palm Springs California is about 85% less than the USA average, and 75% less than the average in California. There are many months each year in Palm Springs with little or no measurable rain at all. A few words can best describe the Palm Springs weather climate and forecast for more than 350 days every year: reliably sunny, warm, clear blue skies, little or no rain. Come enjoy the consistant sunny days. Palm Springs is Sunshine - All the Time! A few words can best describe the Palm Springs weather and climate: Reliable sunshine in Palm Springs, one of the sunniest resort destinations in the USA. In addition, the air quality is almost always good in the Palm Springs area since the mountains provide a barrier preventing the smog above the Los Angeles basin from reaching Palm Springs. (Palm Springs is located about 100 miles east of Los Angeles and Interstate 10 provides a swift path of travel to and from Palm Springs and Los Angeles. The rainfall is almost non-existent and the humidity is low in the Palm Springs area, reflecting the minimal annual rainfall total in Palm Springs is limited to about 5.8 inches, with 10 or fewer days each year during which rain actually falls in Palm Springs, Ca. What's the weather like in Palm Springs in January? January is a beautiful month to visit Palm Springs. The average morning temperature is 44 degrees Fahrenheit or 7 Celsius. The sun rises at 6:50 am. Mid-day the temperature averages around 65-70 degrees Fahrenheit (18-21 Celsius). As the sun sets at 5:00 pm the temperature drops back down to an enjoyable 57 degrees Fahrenheit or 13 Celsius. The average rainfall in January is 1.27 inches. What's the weather like in Palm Springs in February? February is a wonderful month to visit Palm Springs. The average morning temperature is 47 degrees Fahrenheit or 8 Celsius. The sun rises at 6:30 am. Mid-day the temperature hits a high of 75 degrees Fahrenheit or 23 Celsius. As the sun sets at 5:30 pm the temperature drops back down to about 61 degrees Fahrenheit (16 Celsius). The average rainfall in February is 1.15 inches. What's the weather like in Palm Springs in March? March is an ideal month to visit Palm Springs with great sunny weather almost every day. The average daily temperature in Palm Springs in March a beautiful 80 degrees Fahrenheit or 27 Celsius. The sun rises at 6:35 am. The average daily temperature in Palm Springs in March is a high of 80 degrees Fahrenheit or 27 Celsius. As the sun sets at 6:35 pm the temperature cools to a pleasant 65 degrees Fahrenheit (18 Celsius). Does it rain in Palm Springs in March? Very little. The average rainfall during the entire month of March in Palm Springs is less than one inch, an average of 0.63 inches for the month of March. April is one of the most popular months for visitors and vacations in Palm Springs CA. What's the weather in Palm Springs in April? April weather in Palm Springs is reliably sunny and warm. April's mid-day temperature averages around 80-88 degrees Fahrenheit or 27-31 Celsius. April's early morning weather is beautiful, too, with an average early morning temperature of 56 degrees Fahrenheit or 13 Celsius. 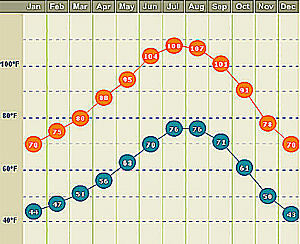 April's mid-day Palm Springs Ca temperature averages around 80-88 degrees Fahrenheit or 27-31 Celsius. The sun sets at about 7:15 pm and the temperature cools to a very comfortable average of 72 degrees Fahrenheit or 22 Celsius in the evenings. Does it rain in Palm Springs in April? The average rainfall in Palm Springs in April is almost non-existent with less than one tenth of an inch on average,for the entire month, a barely measurable 0.08 inches. Palm Springs weather in May? May is a warm and reliably sunny month to visit the Palm Springs California area. The average Palm Springs area high temperature in May is 95 degrees Fahrenheit or 35 Celsius. The sun rises at 5:44 am and sets at 7:46 pm. In the evening, the temperature drops to a very comfortable 79 degrees Fahrenheit (26 Celsius), great for outdoor dining. It rarely - almost never - rains in Palm Springs in May. Rainfall in Palm Springs in May is almost non-existent at 0.15 inches. June is a great month to visit Palm Springs. The average morning temperature is between 70 - 75 degrees Fahrenheit (21-24 Celsius). The sun rises at 5:36 am. Mid-day the temperature hits an average high of 104 degrees Fahrenheit or 40 Celsius. As the sun sets at 7:57 pm the temperature drops back slightly to 87 degrees Fahrenheit or 31 Celsius. The average rainfall in June is barely a trace, less than one tenth of an inch of rain at 0.05 inches. What's the weather like in Palm Springs in July? Hot and sunny weather is the reliable weather norm for July in Palm Springs. The average morning temperature in July is 76 degrees Fahrenheit or 24 Celsius. The sun rises at 5:47 am. Mid-day the July average temperature hits a high of 108 degrees Fahrenheit (42 Celsius). As the sun sets at 7:52 pm the temperature drops back down to about 92 degrees Fahrenheit or 33 Celsius. It rarely rains in Palm Springs, especially in July, as the average rainfall for Palm Springs in July is less than one fifth of one inch at 0.19 inches. What's the weather like in Palm Springs in August? Bright, sunny and reliably warm! The average morning temperature is 76 degrees Fahrenheit or 24 Celsius. The sun rises at 6:09 am. Mid-day the temperature averages between 102 - 107 degrees Fahrenheit (39 - 42 Celsius) and it almost never rains in August. As the sun sets at 7:52 pm, the temperature drops back down to about 92 degrees Fahrenheit or 33 Celsius. What's the weather like in Palm Springs in September? September is an excellent month to visit Palm Springs. The average morning temperature is 71 degrees Fahrenheit or 22 Celsius. The sun rises at 6:29 am. Mid-day the temperature hits an average high of 101 degrees Fahrenheit (39 Celsius). As the sun sets at 6:51 pm the temperature drops back down to a cool 86 degrees Fahrenheit or 30 Celsius. The average rainfall in September is 0.39 inches. What's the weather like in Palm Springs in October? October is a great month to visit Palm Springs. The average morning temperature is 61 degrees Fahrenheit or 16 Celsius. The sun rises at 6:52 am. Mid-day the temperature averages between of 85 - 91 degrees Fahrenheit or 29 - 33 Celsius. As the sun sets at 6:13 pm the temperature drops back down to about 76 degrees Fahrenheit (24 Celsius). The average rainfall in October is 0.11 inches. What's the weather like in Palm Springs in November? What's the weather like in Palm Springs in December? December is sunny and beautiful in Palm Springs. The average morning temperature in December is 43 degrees Fahrenheit or 6 Celsius. The sun rises at 6:44 am. Mid-day the temperature hits an average high of about 70 degrees Fahrenheit or 21 Celsius. The sun sets early, especially with the mountains as a backdrop. With the sun setting at 4:39 pm the temperature drops back down to about 57 degrees Fahrenheit (14 Celsius). The average rainfall in December is about a half of an inch total for the month at 0.61 inches. The Winter climate in the Palm Springs California Desert resorts area is reliably sunny and among the warmest, mildest weather and most beautiful climates in the USA. In Palm Springs, you can count on consistently sunny blue skies - in every month. 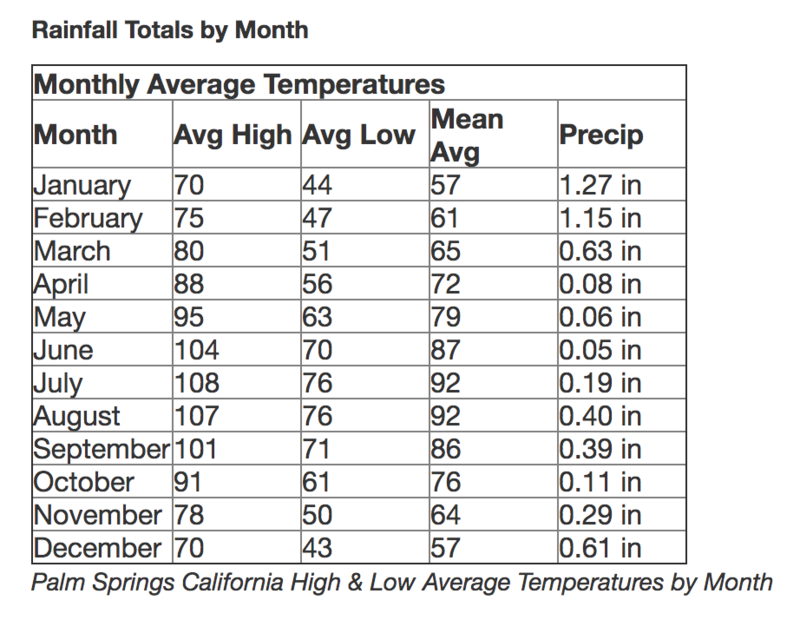 In the winter months of December and January, the average daily high temperatures in Palm Springs are in the mid-to-low 70's and high 60's and increase to the mid-to-high 70s and 80s during February and March. And rainfall in Palm Springs is very limited because of the Desert climate, making reliable sunshine - year round - almost guaranteed! The total annual rainfall in the Palm Springs area is very limited. In January and February the average rainfall is about an inch or less each month. For the year, the average total rainfall in Palm Springs Ca is about 5 inches - or less - for the yearly total. The Winter Climate in Palm Springs: Most people consider it warm - even the coolest of the winter months in the greater Palm Springs metro area of December and January. The evening and night time temperatures can be pleasingly cool and slightly chilly, even brisk, with temperatures dipping quickly when the sun sets behind the mountain range. Night time low temperatures in December and January average in the mid-to-low 40 degrees range. But as soon as the sun appears, the temperatures rise quickly, making the day time temperatures ideal for vacation activities, golf, enjoying nature or relaxing poolside. Reliable Sunshine & Warmth - Year Round! As soon as the reliable desert sun rises each morning, the temperatures climb quickly. In the mornings and evenings during the winter months (early spring and late fall, too) you'll find spring or fall-like jackets comforting, sweaters or sweatshirts desirable, but by mid or late morning or noon, you'll no longer need your light-weight jacket. The average high temperature is rarely less than 65F during the coolest winter months of December and January, though a few nights each year that dip into the mid-to-low 40's briefly at night (lows rarely get much below 38 degrees and the temperatures always warm up quickly as soon as the sun rises the next day). Winter chill? Not really. Most visitors think it's warm in the winter in Palm Springs. Locals think it's cool. And everyone agrees it's beautiful. There is very rarely (perhaps once every couple of years) a brief (nighttime or early morning) frost or a freeze during the late fall or winter months in the Palm Springs area even during the cooler winter months of December and January. Once every ten years or so there may be a light freeze in winter months, but if so, the freeze is brief and usually during night hours only. The light freeze might briefly freeze the water flow of a decorative fountain, but ever so briefly. The morning sun thaws any light freeze very quickly. In the daytime (even in the winter months) in Palm Springs, you'll find sunbathers, swimmers, golfers - tourists and locals alike - wearing shorts and casual clothing suitable for sunny tropical-inspired climates. In the evening and night hours, you'll commonly see sweaters and jackets return as a perfect dinner companion for beautiful outdoor patio dining at home or in one of many of the outstanding indoor-outdoor restaurants in Palm Springs or Palm Desert Ca. Rain and wind storms are the only notable (and rare) Palm Springs winter weather, lasting only a day or two at a time or most. But even in the coolest months, there is very little rain that falls in the greater Palm Springs area. Palm Springs fall weather more closely resembles summer in most other parts of the USA. Summer in the Palm Springs area extends into September and October (and early November)bringing bright sun and clear blue skies with temperatures in the 70 - 80 and 90 degree Fahrenheit range. The average fall temperatures for Palm Springs California are in the high 70s and low to mid 80s for the fall months of October and November. December, January, February and March provide consistent and bright sunshine and beautiful weather for enjoying outdoor activities such as swimming, golf, tennis and hiking. Beautiful weather, reliable and consistent sunshine all throughout the year make Palm Springs a world-famous year-round destination and attractive location for golf, nature and sun-seeking enthusiasts. The daytime temperatures in Palm Springs begin to warm up steadily during early spring, starting in mid February with March, April and May producing reliable and consistent bright sunshine with gorgeous days where temperatures reach the high 70s to low to mid-80s. Does it Rain in Palm Springs? There is very little rainfall in Palm Springs during Spring. The very limited amount of rain that falls in Palm Springs is usually limited to late fall and early Winter and the months of December through February; even then rain is very rare and mostly limited to brief showers. In fact, the average monthly rainfall total for the January and February is approximately one inch. In March, average total rainfall for the month is very low - about one half of one inch. The total yearly rainfall in the Palm Springs area is very low - on average about 5 inches (or less) during the entire year. March weather in Palm Springs brings brilliant sunshine and pleasantly warm temperatures with highs in the mid-70s and low-80 degree temperatures with very little rainfall. In fact, rainfall in March in the Palm Springs metro area is usually less than one inch of rain total for the entire month. April and May weather in Palm Springs is gorgeous and consistently sunny. April is characterized by bright sunshine, warm and dry air, and daily high temperatures in the mid to high 80 degree range, rising into the low to mid 90s consistently during May. May brings a few days that surpass the 100F (38C) mark for the first time in May, though all months except for Dec, Jan and Feb have recorded a few 100 degree days, the Palm Springs weather records show, something unmatched by any other US destination. July, August and September are the warmest months in Palm Springs with daily average temperatures in the low to mid-100s. Evening temperatures once the sun goes down decrease to a nightly lows in the 60 and 70 degree ranges. Summer weather extends well into late August and September, with October bringing summer-like weather with average high temperatures in the low to mid-90s. Reliable and consistent sunshine continues throughout October and November with almost no rain. (Average rainfall in October in the Palm Springs Ca area is less than one tenth of one inch, almost non-existent. The sun is bright and warm and there are a few days where the high temperature reaches 100 degrees, but the average daily high is around 90 degrees in October. The Summer high temperatures in Palm Springs are not quite so extreme as other locations in the Sonoran Desert further west; the proximity to the Pacific Ocean limits normal highs to around 110F in the Palm Springs area, unlike the 120F or higher for a few places along the Colorado River and around Death Valley, but Palm Springs is one of the top five consistently hot cities in the US. Nearly 75% of the homes in Palm Springs have private swimming pools, so cooling off on summer months is easy to do. Many vacationers and home-buyers purchasing real estate in Palm Springs want to know: "Does Palm Springs have a good solid water supply?" The answer is yes. Although it rarely rains in Palm Springs, the Palm Springs area water supply outlook is good and has a steady supply from several sources: water from the run-off from nearby mountain peaks, a supply from wells deep beneath the earth, known as the Palm Springs area aquifer, and water purchases from the Colorado River. The Palm Springs water municipalities replenish the water supply to the aquifer reservoir by purchasing millions of gallons of water each year from the Colorado River. With continued sensible water use and conservation that the Palm Springs area water agencies encourage and that residents value, the Palm Springs area's water supply outlook appears very good for the future. The Palm Springs area benefits from a steady supply from multiple sources - proving a reliable water supply for Palm Springs communities for generations to come.